Gubu World is an Irishmans view of global affairs. Gubu is an Irish political phrase that stands for grotesque, unbelievable, bizare and unprecendented. Gubu World is a polictical blog that debates international issues of contention. While keeping an eye on events in Ireland we regularly debate developments in Iraq, Iran, Israel and other troubled spots. I never thought the unrest in Syria would reach the same levels of that which has gone before in Libya, Egypt and Tunisia. I was wrong. I thought that because Bashar Al Assad is younger, sharper and more in touch with world trends that he would prevent (through a combination of conciliation and oppression) the emergence of a revolutionary situation. Again, I was wrong. This week Obama called for Assad to step down stating that his fall was inevitable. Due to the sectarian element in Syria I thought the US would be reluctant to encourage further unrest in Damascus as was the case in Bahrain. However I believe geopolitical opportunities have overridden any such concerns. Assad's Allawite sect, which is similar but not identical to the Shia Islam that we are familiar with from Iran and Iraq, represent the ruling minority in Syria and are seen by many Arabs as being the gateway with which the sinister Persian regime in Tehran can meddle in Arab affairs. For this reason I believe there is a growing international consensus that Assad must throw in the towel. From a western point of view the fall of Assad and the Allawite sect could be highly rewarding as it would mean a major loss of influence and power for Hezbollah in Lebanon who would be isolated and unable to rely on the Iranians for training and supplies. So much so that if Assad were to go the way of Gadaffi and Mubarak, it would make the Iranian threat look significantly less serious. I give him until the summer. A little bit too pro Israeli ! I really can't stand watching Republicans trying to out do each other in being more pro Israeli than the next candidate. This was the case at the Republican debate in Florida last night. Only Ron Paul tells the truth when he says that some Americans are more pro "Israeli than the Israelis". According to Next Gingrich the Palestinians are an "invented people" and that two hours after he becomes President he will issue an executive order moving the US embassy in Israel from Tel Aviv to Jerusalem. The reason statements like these bother me is because it is the most blatant example one can ever imaging of a politician attempting to fire up their base by making outlandish remarks which in the event that they actually become president they would never be able to stand by. American national interest in the region is not all just about Israel. There happens to be an Arab Spring, a war in Afghanistan, an unstable Iraq not to mention an Iran on the verge of obtaining nukes. 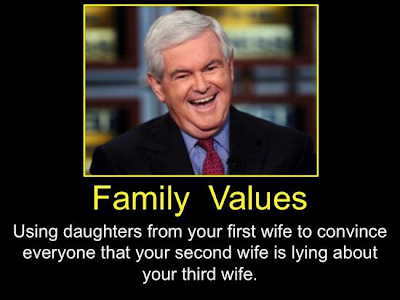 Good luck President Gingrich in dealing with all that when you don't have a single Arab Ally, which would be the case after Newt the Chief declares from the Oval office that the Palestinians are not a real people. Why can't Republicans be pro Israeli, yet pragmatic. I have seen most of Obamas State of the Union address in clips today. I have also seen much of the criticism from prominent Republicans and conservative pundits which was all rather predictable and boring. However one element of the criticism which I fully agreed with was the repetitive nature of this event. See the clip below which demonstrates this quite remarkably. I must apologise to any Newt fans out there but I just had to put this up. The Republicans seem to me to be making a big mistake in their thinking. They don't realise that Barack Obama is not Jimmy Carter and Newt Gingrich is not Ronald Reagan. This is an altogether different showdown requiring a much different approach. If they don't get to grips with this they will lose. 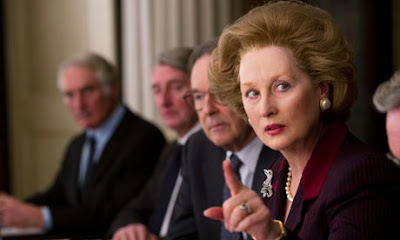 I saw the movie The Iron lady last night. As a history and politics fan I must say that I was highly disappointed. I suppose I would recommend that people see it given the enormity of the film but be warned, Gubu World readers will find it a let down. The fact that the film intensely irritated me has nothing to do with politics or the Thatcher persona. I was simply annoyed at the style of the film. I was very excited about seeing a movie on the life of one the the 20th centuries most interesting characters. Instead, over half of the movie dealt with how Thatcher was dealing with old age. To be blunt, there is nothing unique about growing old and dealing with the passing of loved ones. We will all go through this if we're lucky. There is something very much unique about being Britain's longest, most controversial, arguably most successful and first female Prime Minister yet the movie kept flashing forward to the 2012 Maggie sitting around her London Apartment hallucinating about her dead husband. I found this utterly pointless and became very frustrated when the movie began to explore interesting events such as the Falkans or the IRA hunger strikers only to flash forward to 2012 after only a few minutes. Anyway, that's my rant over. But I do think that the occasion is worthy of my own brief analysis of Thatcher, which is unique given that I hold fairly conservative views but am also a proud Irishman from a Northern Catholic background. I look back at Margaret Thatcher's 11 years in Downing Street and I admire her for it. It is clear that in the 1970's Britain was descending into mediocrity. By taking on the unions and confronting the Keynesian ethos that was over running the nation she reversed Britain's post war downward trajectory. I'm not going to get into a discussion about the merits of her economic philosophy except to say that her belief in free markets clearly affected her world view and is the main reason she found a partner in Ronald Reagan. She shared Reagan's view that coexistence with the USSR was not the goal. In this respect she was undoubtedly on the right side of history. Her legacy on Northern Ireland is not as clear cut. She stood up to the IRA which should be commended. However she continually rejected outreaches from constitutional nationalists in the north and in Dublin. Even worse was her tendency to show off to hardliners and unionists by making statements that she was never going to be able to stand by like when she said that Northern Ireland was as "British as Finchly". Her general attitude in my view made the conflict more difficult to solve. She had an ally in the late Garret Fitzgerald who was fiercely anti provo but whom she instead preferred to humiliate by publicly rejecting all of his proposals. Of course this attitude was never sustainable and she had to do a complete u turn which culminated in the 1985 Anglo Irish Agreement, a settlement which caused the likes of Ian Paisley to call her a "wicket traitor". Her stubbornness was perhaps understandable given that Republicans had killed close friends of hers like Airey Naeve (an incident which the movie actually does portray quite well) and came astonishingly close to wiping out the whole cabinet at Brighton. But her hard line approach can hardly be credited with bringing the conflict to an end, and as commander of British forces she does bare responsibility for elements of collusion that occurred between British forces and loyalist paramilitaries. However sometimes we Irish can get a little caught up in our own affairs. The implosion of the USSR was a monumental event in world history and of much greater significance than Northern Ireland. Margaret Thatcher's role in it guarantees her place in history as one of the great historical figures of the 20th century. Every chance he gets Newt Gingrich refers to President Obama as the food stamp President. And on every occasion that he does so he gets accused of making a racially charged remark. For my non American readers allow me to clarify that a food stamp is a welfare document for purchasing food only. 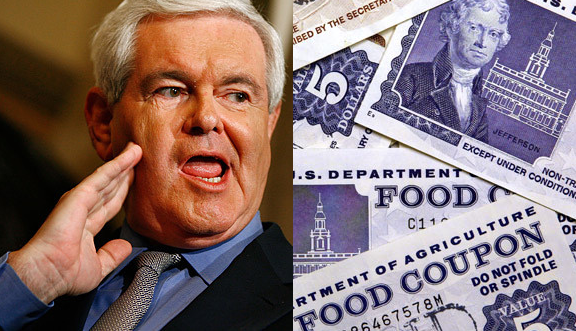 Let me make clear, I don't believe Newt Gingrich is a racist but I do believe he deliberately uses the phrase "Food Stamp President" in the hope that he gets accused of being a racist because nothing generates publicity like an accusation of racism. It also fires up his base and others who sympathise. To be accused of being racist is a horrible thing and Mr Gingrich knows that it is a controversial issue that will get many Americans on his side. It suits Gingrich and others to reinforce the perception that criticising Obama is racist. However I have no memory of either President Obama or anyone in his administration ever playing the race card. Some bloggers and left wing commentators do because once again race is ratings gold. I believe it is primarily the media who inject race into politics which some politicians then exploit to their advantage. I really hope this doesn't begin to dominate the campaign. Watch Newt below being interviewed on MSNBC. Note his comment on the "automatic reference to racism". A few days ago I asked my Father a very interesting question. I said "Dad, If you were an American would you vote Democrat or Republican". He answered "Democrat". The thing is, my Father is a right wing pro business conservative, so why would he vote Democrat. He went on to say that he could identify more with the Democratic party because he is an Irish Catholic and that traditionally, Irish Americans voted Democrat. Incidentally identity politics in Ireland is something we know all about as the two main parties, Fianna Fail and Fine Gael are ideologically indistinguishable. The reason I asked my father this question in the first place is because I have realised recently that sooner or later Gubu World is going to have to shake the political world to its core and endorse a candidate for President. I have never supported a Republican for President before although I have acknowledged that I was much too hard on George W Bush and think he was a better President than John Kerry would have been. But in 2012 surely the time has come for me to openly support a Republican candidate. And I must say I like Mitt Romney and do believe that a successful business man is the best type of person to address a massive debt problem. 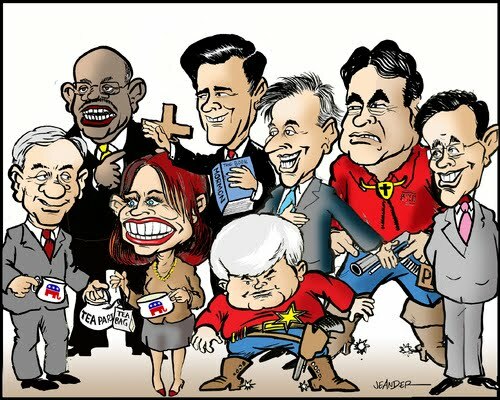 But damn it there is something about the Republicans that just irk me and I can't really explain it. Well let me try. Recently I saw an add by Cuban American Congressman Marco Rubio in which he criticises Obama for turning America into a European style welfare state. He opened the advert by saying "My parents fled a country that was pretty much like every other country in the world". Now wait a minute, my country is nothing like Cuba. This genuinely offended me. You can imagine the satisfaction I felt when I heard that Marco Rubio was coming under fire because it emerged that his parents actually fled Cuba a few years before Castro came to power so his sob story was a fib. However Rubio's rant also made me realise something else. Conservative Republicans despise Europe. I mean it really disgusts them. They see us at repulsive welfare states that won't stand up for anything. This does not make me bitter, after all it is very obvious to me that most liberal Europeans despise the United States. But I got to thinking, particularly after watching one of the Republican debates where the candidates were all trying to outdo each other in explaining how un European they are, why should I support a candidate from a party whose dislike for my country is so intense. I know this is not a particularly sophisticated point but we are not dealing with sophisticated things here. Identity politics is tribal by nature. I should be a clear Republican supporter, particularly since my main concern, the Irish economy, would benefit enormously if the US economy were to come roaring back in 2013 with a dynamic fiscal conservative at the helm. That said, I really wish the Republican candidates could just work a bit on being more likable. Some clearly think that being disliked is actually a good thing. I would like to remind them than Ronald Reagan was not only a visionary who liberated half of Europe, he was also adorable. 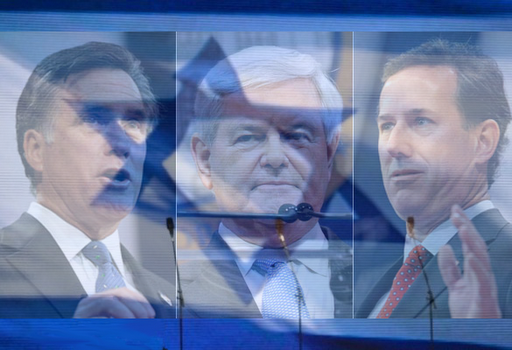 Newt hits back at Mitt in this latest negative add in the Republican race. Newt Gingrich spent much of the last two weeks complaining about Mitt Romney's negative adds in Iowa and New Hampshire. Well the gloves appear to be well and truly off now. The main issue from all of this as I see it is that if Romney gets the nod, which is highly likely, it is very difficult to imagine Newt or his supporters enthusiastically campaigning for him. I am working on a detailed post about my impressions of the Republican primaries. Watch out for it tomorrow. Gubu World is a blog that was set up in 2007 in order to discus global politics with a particular emphasis on the Middle East. 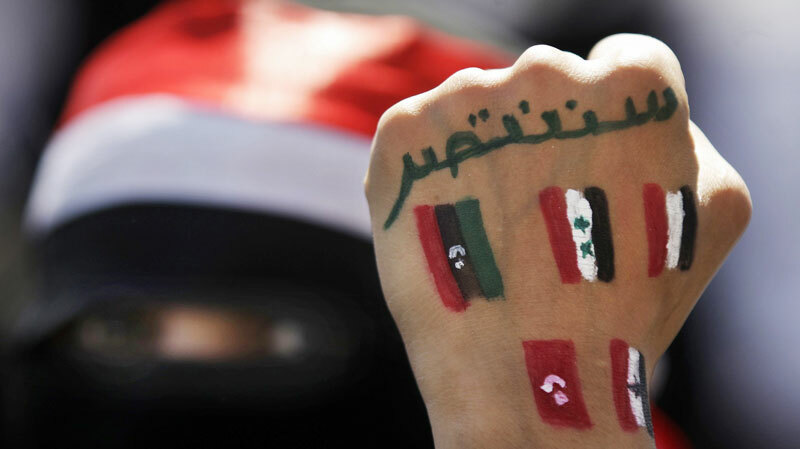 I could never have predicted what a momentous year for the Arab World 2011 would be. We all watched in shock as millions thwarted the authorities whose ability to control information and assembly was drastically undermined by the social networking generation. My view throughout all of last year remains the same today which is that the unrest in the region is essentially a good thing. However, given the instability that the revolutions and regime changes have caused I want to do a very important post about what it means for the region, for democracy in the Arab World, for Israeli security and western interests. The unrest is a good thing. 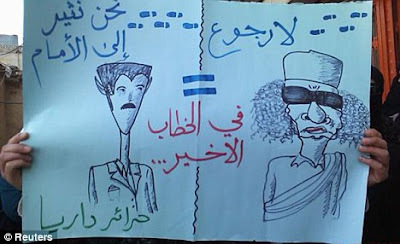 It is a good thing for democracy and the dignity of man that the Gadaffi, Mubarak and Ben Ali regimes have been overthrown. I said many times on Gubu World last year that the era of the Arab strong man who seizes control of a nation and holds it until his death has come to an end. Of course what replaces this model will be far from a western style pluralist democracy. But what did we really expect. The alternative is likely to be a multi party system that accommodates Islamists, nationalists and democrats. It will have some successes and some failures but the Arab people deserve their shot at democracy. I for one am getting a little tired of reading posts and articles, mainly from the Pro Israeli right, about the "new Egypt" and the "new Libya" where people single out an incident of a backward Islamic practise and use it to invalidate the wider movement against the tyrants of the region. President Obama is coming under increasing criticism from some in the Republican Party for throwing the Pro Western Mubarak under the bus and jeopardising Western security in the process. Strange really when you consider that during the Bush era the general consensus was that democracy needed to be brought forcefully to the region. Now some of the same people are feeling very uneasy that the Arabs are trying to do it themselves. So what exactly are the legitimate concerns of the decision makers in Washington, London and elsewhere. Obviously the US does not want to see a new government emerge from the turmoil that is anti western and promotes terrorism. But does that give them the right to intervene in order to prevent unrest and preserve a pro western dictatorship? Let us consider the following. I have always argued that during the Cold War covert CIA action in South America to prop up right wing dictators was justifiable because the consequences of inaction potentially included nuclear war. The world survived the Cuban Missile Crisis. It might not have survived a Chilean Missile Crisis. So in my view, in extreme situations the US can and should play God. This raises the crucial question, just how vital is it for the US that Islamists are kept out of power in the Middle East. Is it vital? Yes. But is a matter of life and death for the nation? No. Keeping the Muslim Brotherhood out of power in Egypt may not be a matter of life and death for America, but it certainly is for Israel. The lesser of two evils scenario that America faced during the Cold War is a situation that Israel finds itself in constantly. Israel seems to go through a Cuban Missile Crisis of some sort every year. But Israel alone does not have the capability to take covert preemptive action to prevent the emergence of an Islamist government. So now the question becomes, just how vital is it for American national Security that Israel be defended? Is it so important that the US should put a stop to the Arab Spring. Some clearly think it is. 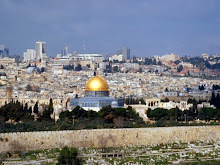 And after all, if you subscribe to the doctrine, as I do that if Israel falls it would embolden Islamists across the region propelling them to power in every Arab nation and that Europe would be their next target, then you must conclude that the preservation of Israel is a life or death issue for the west as well. However this conundrum must be examined from different angles. Israel is a nation of seven million people. There are 270 million Arabs living across 22 nations. A foreign policy designed to preserve dictatorship in the Arab world so that the seven million inhabitants of Israel can live in safety makes little sense. I suppose the truth is nobody really believes that the White House should have protected Mubarak, not when so much of the discourse over the past decade has been about bringing democracy to the Middle East. In truth, what I am hearing is most likely Republicans grasping at straws when it comes to criticising Obamas Foreign Policy which they will probably privately admit, has been better than expected. However if the Muslim Brotherhood do seize control in Egypt and Islamists look like coming to power in Libya this debate will develop into the most serious dilemma in US Foreign Policy in thirty years. And the question at the center of the dilemma will be, just how important is Israel to America and the west. 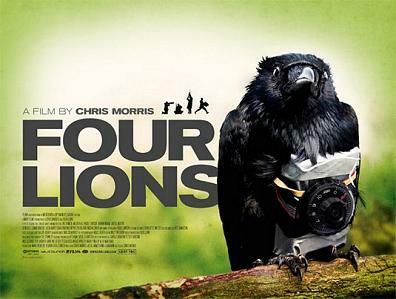 Last night I watched the British movie Four Lions, a brilliant satirical take on the madness that is Islamic fanaticism. The movie surrounds the lives of four radical but incompetent British Muslims living in Sheffield Northern England. It was the funniest movie I have seen in a long time and I would recommend it to anyone regardless of their faith or views. I have been thinking today about whether the film is offensive to either Muslims or victims of Islamic terrorism and I have concluded that it isn't or at least that it shouldn't be although one cannot deny how politically incorrect in the extreme it is to make a comedy about four British Muslims hell bent on committing a suicide terrorist attack against Britain. Personally I enjoy laughing at what we are not supposed to in this modern day world of politically correct appropriateness. However the movie does have a serious point to it although it clearly uses humor to achieve it. And that point is that delusions and stupidity lie at the center of extremism. My favourite scene of the movie is when the four men are transporting their bomb materials from one location to another when their car breaks down. The English convert among the group curses the car and blames the breakdown on its "Jewish parts" before claiming that the Jews make all the spark plugs the world over in order to "control global traffic". The leader of the group suggests that the men abandon the car and regroup in a shed behind a nearby field before he warns them to be careful with the volatile material they are carrying. Watch what happens next. Are you still laughing? Even funnier is the eulogy the three men offer their fallen comrade who courageously took out one Kuffar sheep whilst attacking the enemies source of food. In 1982 Irelands most wanted criminal, a double murderer was arrested in the home of the attorney general whom he was aquainted with socially. The Taoiseach (Irish Prime minister) of the day, Charles Haughey, described the event as being grotesque, unbelievable, bizarre and unprecendented. The phrase gubu was born. The creator of this blog believes that gubu is a perfectly appropriate phrase to describe the sequence of global events that have occurred since the outbreak of the second intifada in September 2000 and the present day. This time line incorporates many grotesque, unbelievable, bizarre and unprecedented events such as September 11th, the invasion of Afghanistan, the Iraq war, genocide in Darfur, the Iranian nuclear crisis and the second Lebanon war. Gubu World is committed to instigating intelligent and rational debate in order to make some sense of the madness. My name is Ted Leddy. I am a 29 year old Irishman with an intense interest in global affairs, particularly within the Middle East. I am interested in debating with people on the following issues. Israel, Jewish politics, The Israeli Palestinian peace process, Iran and Iraq. I also intend to regularly commentate on the progress of President Obamas presidency keeping a particular eye on his foreign policy.